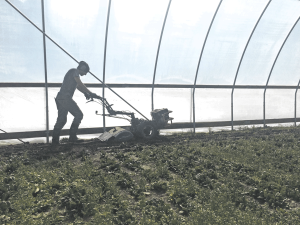 Although John Ferree and Kate Lietz came from somewhat different farming backgrounds, their combined experience turned out to be just right for their new venture in Free Soil, MI. 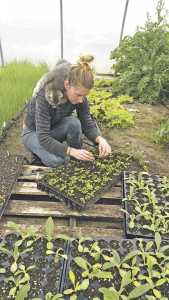 The Little Red CSA was started in 2015, and while Kate said they had a hard time getting people on board, she realized part of that was being new to the area. “We distribute mid-June through the end of September,” she said. “Sometimes we tag on a shorter CSA for fall.” Kate said they’ve tried several distribution methods, including on-farm pickup and farmers markets, and will add several drop sites this season. John explained the Little Red Organics CSA model: “On Friday, we do an inventory of what’s coming in the next week. That inventory is posted in the online store on Saturday morning. People who have a subscription have four days to modify their box contents. The ‘store’ closes on Tuesday afternoon, and we pack boxes on Wednesday.” John believes some of the struggles with CSAs are the result of competition with home delivery services that have massive marketing budgets. “We ask our customers to try along with us,” said Kate, adding that she and John select what they enjoy growing. “That doesn’t mean we’re going to keep something people don’t like, but we’re willing to expose people to something they aren’t familiar with.” Customers are provided with recipes and tips to help them learn about preparing unfamiliar vegetables. In order to extend the growing season, John and Kate rely on several hoop structures and caterpillar tunnels. John refers to himself as a greenhouse scavenger, and searches online for second-hand structures to refurbish. One rebuilt house is heated for propagation as well as growing. Little Red Organics also has two caterpillar tunnels, a 12’ x 80’ shade house and a 30’ x 96’ Quonset tunnel. A wood boiler provides heat for tunnels. One flower staple is lisianthus, a good producer and unique to the area. Sunflowers are also popular, especially in bouquets, so John and Kate plant this favorite in several successions to last throughout the season. Although they try new varieties each year, they rely on flowers that hold up well in bouquets. John and Kate rely on several practices to maintain and build soil fertility. “We’ve taken a slower approach to soil building, and that’s where cover crops come in,” said John. “We use rye, vetch and sudex (sorghum sudangrass) and buckwheat to drive out weeds.” John uses a flail chopper and rotavator to knock down and incorporate crop residue. Visit Little Red Organics on Facebook and at www.LittleRedOrganics.com.